Standard telemetry sensors use your vehicle’s gear ratio and tire size to calculate speed based on RPM. This system works well for hard surfaces, but wheelspin on loose surfaces causes inaccurate speed readings. 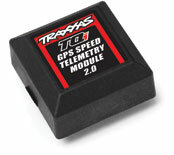 The Telemetry Expander 2.0 with the installed GPS Module 2.0 provides the most accurate speed data possible. 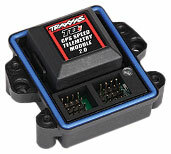 The Traxxas GPS Module 2.0 uses both GPS and GLONASS global positioning to deliver precise, real-time speed information via the Traxxas Link App on your TQi Radio System with Traxxas Link Wireless Module. The GPS Module 2.0 installs easily inside the waterproof Telemetry Expander Module 2.0 (#6550X, sold separately). The Traxxas Link App automatically recognizes the sensor with no other programming or setup required! Once the GPS module is installed, the speedometer reverts to GPS speed instead of estimating the MPH based on gearing and motor RPM. Nothing needs to be reset; just select your preferred gauge and start receiving accurate speed data through the Traxxas Link App.